Vamana, Vasu and Yamuna eating cauliflower leaves together. 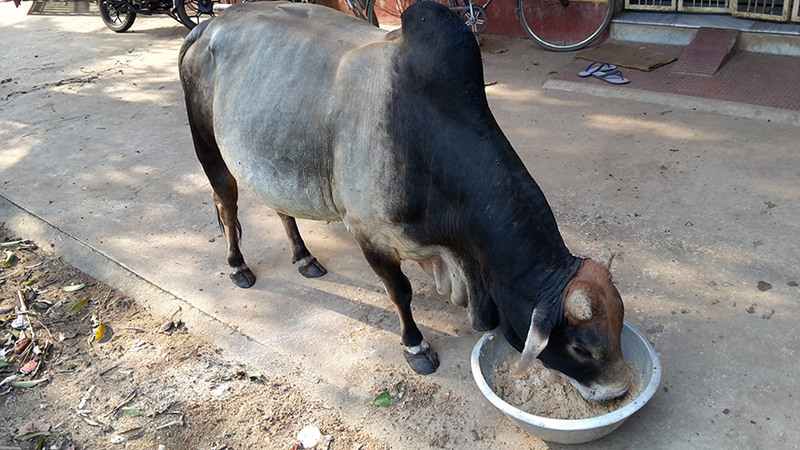 We first began our goshala in 2013 when Vamana the bull was donated to our temple in Orissa, by a local villager. He had been coming to our temple every day for two years prior to that and we had been feeding him every day. After some time he didn’t want to go home and was spending all his time at our ashram. 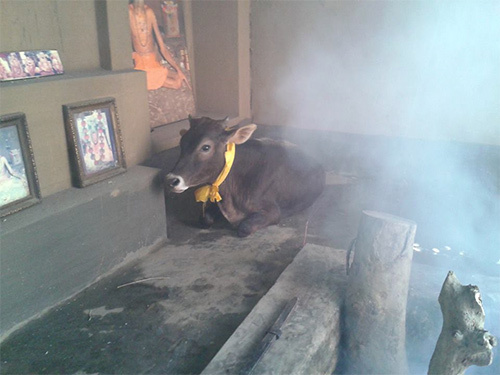 Seeing this, the owner agreed to donate him to the temple, and that was the beginning of our goshala. About a year later, a sadhu who stays in the forest around 50 km from here wanted to give a female calf to our ashram. Her name was Yamuna. As soon as she entered our goshala she and Vamana became best of friends. Early this year the same sadhu wanted to donate a bull calf named Vasu to our ashram. He also fit in perfectly with the others and they all became best friends. So at present we are taking care of two bulls and one cow. Yamuna the cow. She came as a small calf but is now huge. Vasu the bull. He has also grown very large in a short time. Vamana is the eldest and the leader of the others. 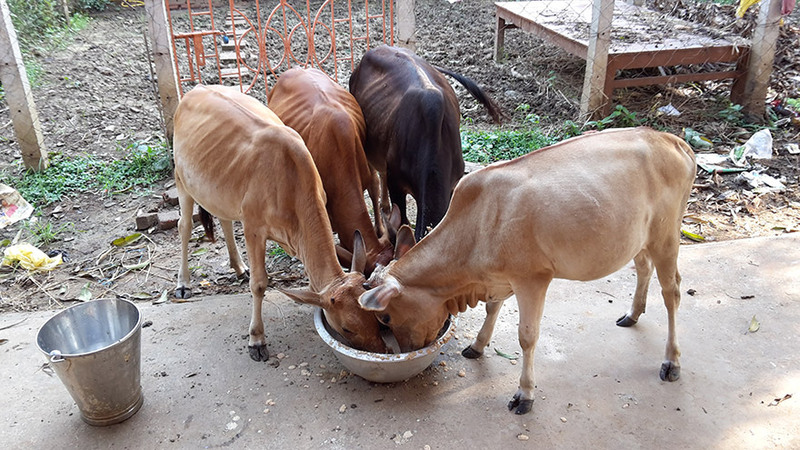 The aim of our goshala is not to get milk or anything else from the cows, but simply to serve them as an offering to God. Protection of cows is essential for the establishment of Vedic culture. The entire Vedic culture revolves around respect to cows. 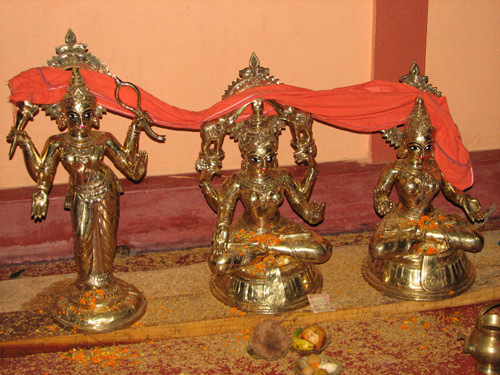 Yajna, sacrificial offerings, are the central pivot of the dharma chakra. The essential ingredients for yajna are ghee and cow dung, which both come from the cow. Without the cow, our link to the devas, the universal controllers of nature, is lost. 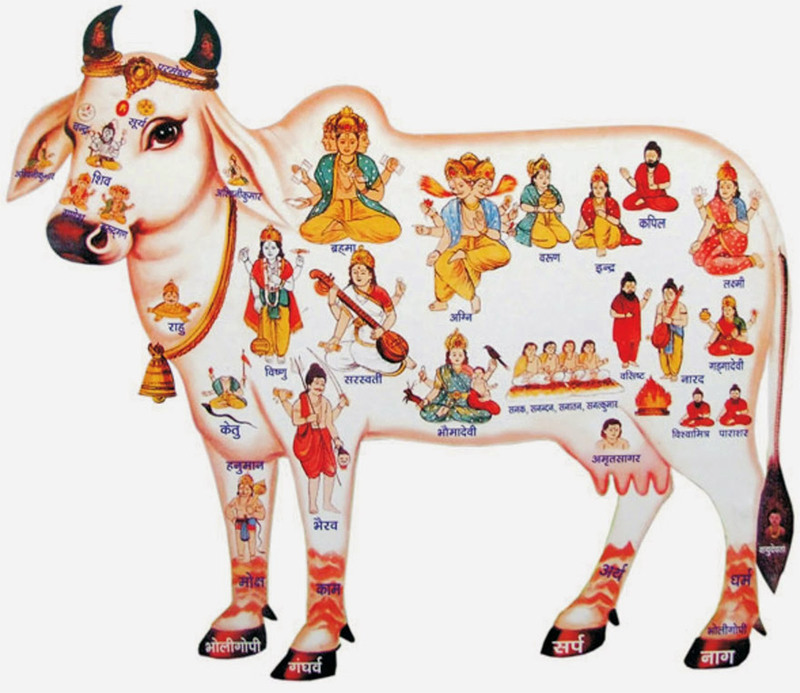 Therefore it is said that within the body of the cow reside all 330 million devas, and by worshipping the cow one automatically worships and pleases the 330 million devas. 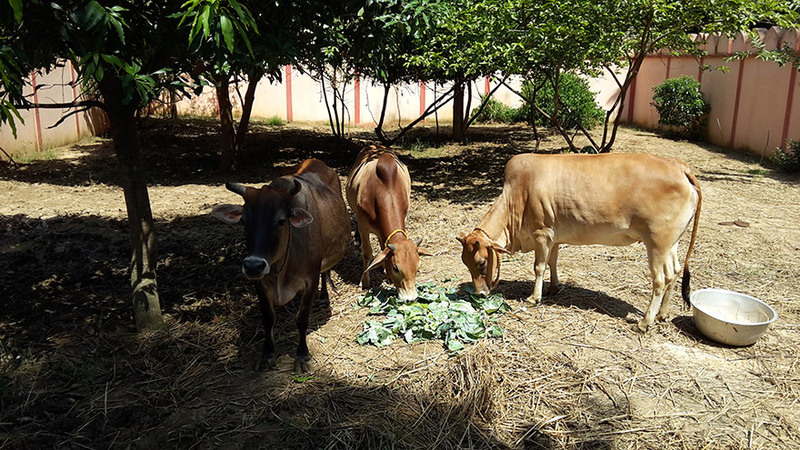 Besides our three residents, we also daily feed two homeless bulls, and four baby calves who visit our ashram twice a day. The baby calves have been coming for several months, and always show up at our ashram gate at 7 am, mooing so that we know to let them in. 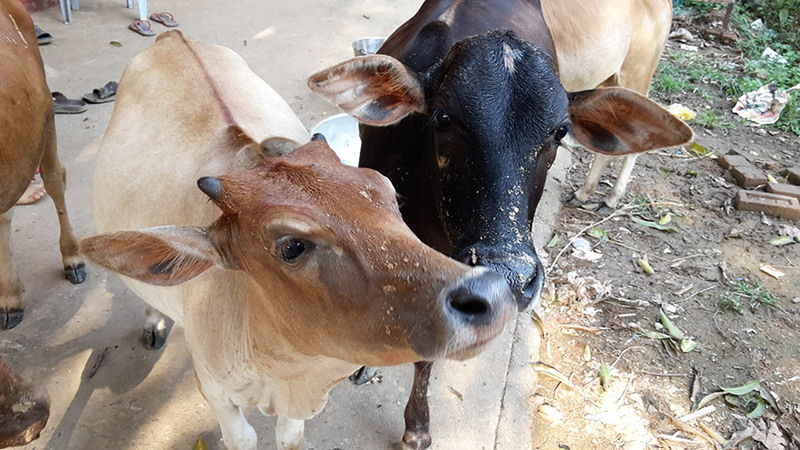 The two bulls have been coming to our ashram for food for 5 years. Originally there were three bulls, but one became very old and passed away a couple years ago. The roaming bulls come to our ashram twice a day, in the morning and the evening. 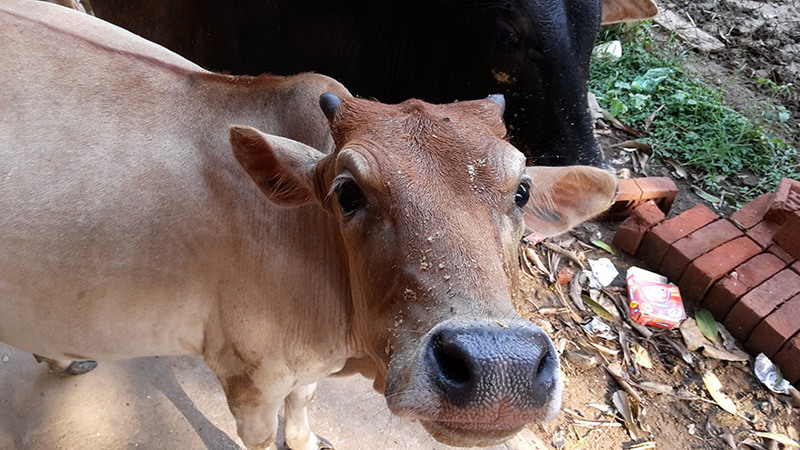 Anytime there is heavy rain or a flood, they will always come to our ashram because they know they will get nice food and a warm place to stay. 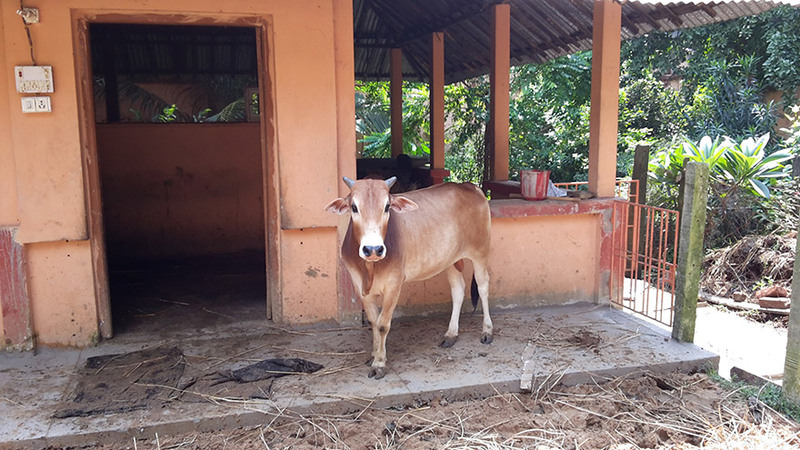 Last year when there was severe flooding in our city due to a cyclone, the bulls all showed up at our ashram and spent the night in various rooms. 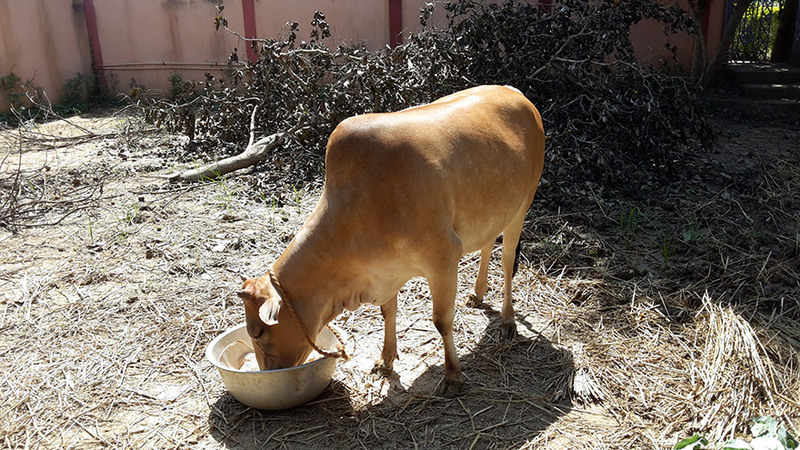 The homeless bulls are always welcome to stay in our ashram goshala, but they have been accustomed their whole life to roam and don’t like to stay in one place very long. Still, they know where to come when they are hungry or need anything. The four baby calves who come every day to our ashram for food. The younger bull, named Nandi, who visits twice a day for food. We feed everyone wheat bran mixed with water, and a little salt. We have tried various feeds for them (such as rice bran, pellets, etc.) and found all cows prefer wheat bran over anything else. Next month we are going to try to grow some tall feed grass to give them some more greenery. If you would like to help sponsor food for our cows and the visiting bulls you can use the following form to donate. Each month the cows and bulls (including the visitors) go through ten 50 kg bags of wheat bran. One bag of wheat bran currently costs 860 rupees ($13.50 USD). The monthly cost for all of their food is 8,600 rupees ($135 USD). “Use ghee in fire sacrifices. Use ghee in all auspicious activities. Donate ghee and also use it for personal necessities. By doing this, the human beings will always support the cows and understand their value. 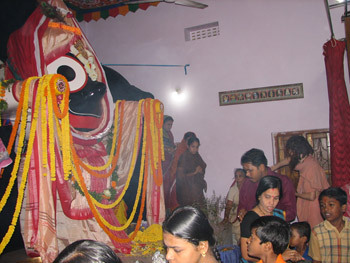 This entry was posted in Ashram News by Jahnava Nitai Das. Bookmark the permalink. This is a beautiful article regarding the cows and bulls. I and my family (devotees of Lord Krishna) are all vegan. So not only do we not eat meat, eggs or fish but we do not consume any dairy products, nor do we wear any leather. In the UK it is easy to purchase plant milk and because there is such cruelty in the dairy industry here, to say nothing of the horror of the slaughterhouses, we feel able to show our respect and love for God and all of God’s creation by following a vegan diet. All Glories to Mother Kamadhenu and Father Nandi in the form of your lovely cows and bulls, as well as all of them everywhere. Beautiful article, thank you. I look forward to participating in your feeding program and feel so blessed to have such an opportunity! Not one leader in the world has Guts to act & act fast in public intrest….. I am a Hindu , we are thought that the GOD created the world so everything we see are his creations, As a human how can I kill his creations just for hunger….Killing and eatings is a animal tendency,, we are humans should have a better way to live. 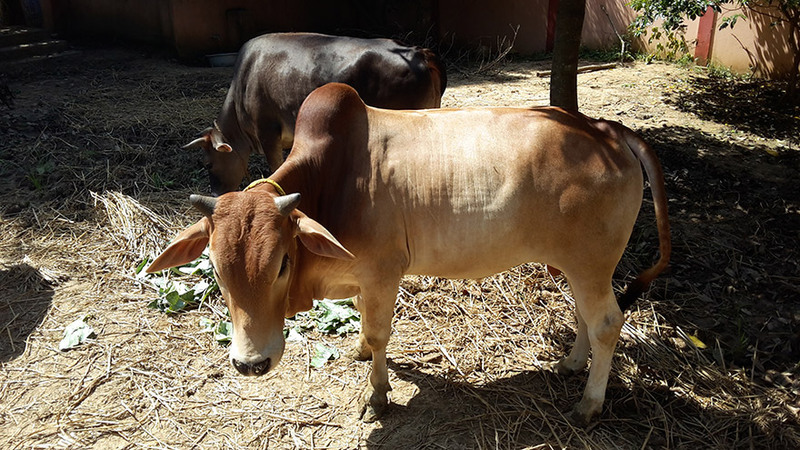 The Vedas say Pashun Paahi protect the animals; Gaam maa hinsi, Avim maa hinsih, Dvipadam chatuspadam maa hinsih do not injure the cows goats bipeds quadrupeds. The 5th mahayajna is the Balivaivadeva Yajna that is the 5th daily great duty is to take care of the animals, to feed them to protect them. Maharishi Svami Dayanand Sarasvati wrote a book called GOKARUNANIDHI as an appeal for cow protection. The English version is called an ocean of mercy to the cow. Lovely to read. However as a vegan I live with respect and honouring of all sentient life, no eating or using of any animal products including ghee. This is a beautiful article. I thank you for it. When I went to France for the first time in 1973, an old woman who was related to a friend of mine asked the question whether cows, bulls, buffaloes and sheep were allowed to roam freely on the road causing the traffic to slow down. She could not understand why they were not slaughtered for food. I started thinking what will happen to the nation’s economy if this was done and none of these animals were given the freedom to roam around as they pleased. The situation has not changed much even now. I had to come up with some reply. I thought of Lord Vishnu’s 10 avatharams in which he appears as a fish, tortoise, boar, lion, a pigmy, a woodcutter, archer, cowherd and finally a horseman. 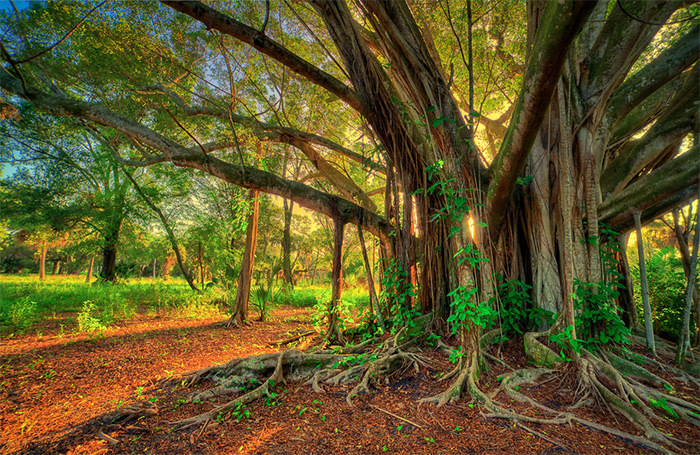 I told her that we see god in all these incarnations and we cannot hunt them for food. 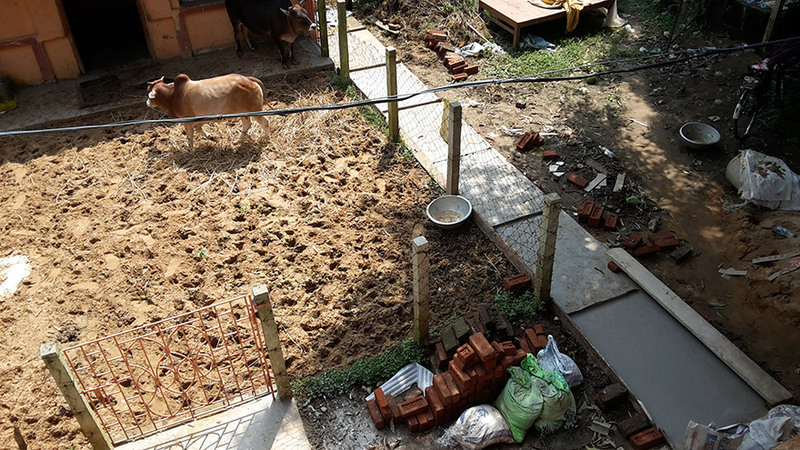 We have enough space to grow grains and these animals are useful for our economy as well, because our entire village economy is based on such animals helping mankind. I do not whether she understood what I said. Perhaps she considered it as a joke and laughed it off! Fantastic article and mind blowing. I will forward to all my friends. Beautiful article about the cows, animals understand love & kindness, I admire you people for doing whatever you can for the cows , bulls & the beautiful children. I pray from my heart for all. Wonderful videos of the sacred cows and bulls. I wish to donate whatever I can whenever I can. Makes me proud to follow Hinduism. Man can get food by any means but poor animals? Bhootadaya ia the most important dharma! It is very moving article. 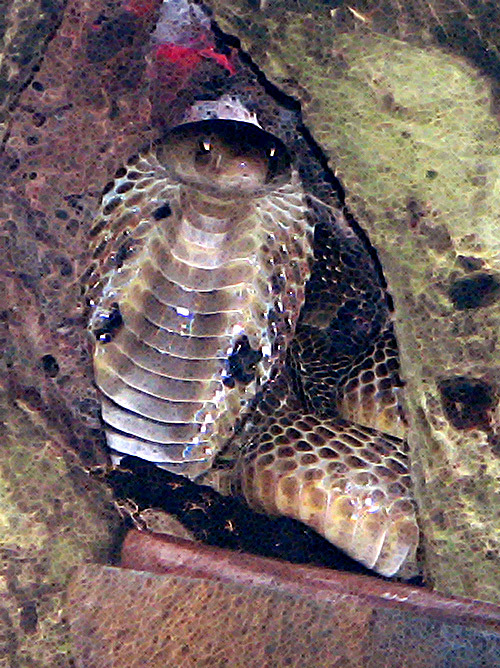 This is so nice, all creatures should be protected. 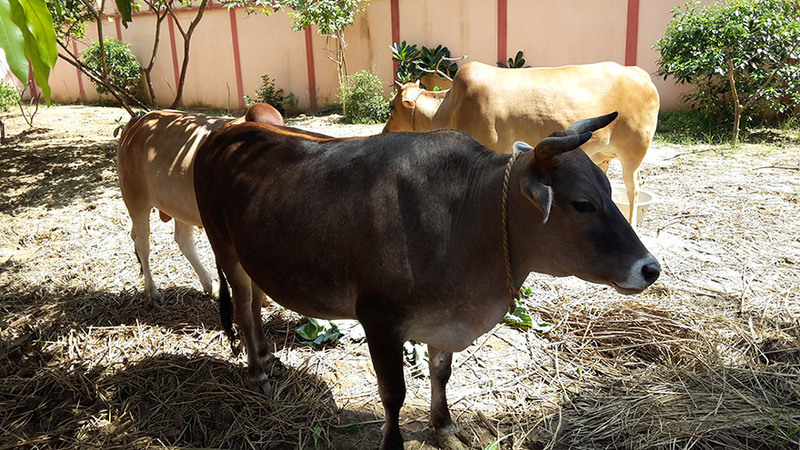 But if possible copulation of non indigenous cows breed (humpless) should be avoided.